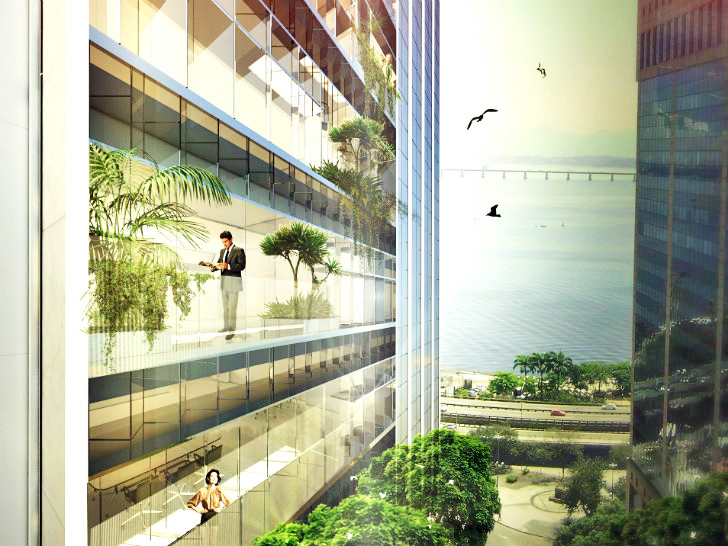 Rio Branco 12 (RB12) is set to be one of the most sustainable new buildings in Rio de Janeiro once completed. The luxury office tower will be located in the city's burgeoning Porto Maravilha district, where it will lead the way in responsible development. Designed by French-Brazilian firm Triptyque and built by Natekko, a French construction firm, RB12 will feature a host of sustainable design strategies including a bioclimatic facade, solar power, and fuel cells that will make it fully self-sufficient in terms of energy use. The Rio Branco 12 office tower on Rio Branco Avenue will have 21 floors. Currently undergoing an urban revitalization, Porto Maravilha is slated to become a new urban and commercial district with over 5 million sq ft being redeveloped along with new roadways, a public tram line and new public green space. The eco office tower was designed by Triptyque, will be built by Natekko and is funded by MMC Investimentos, which is working on affordable housing and green-refurbishment in São Paulo and Rio de Janeiro. RB12 will be both luxurious and sustainable and the developers hope to set a new standard of development with its construction. The facade has been carefully designed for both indoor occupant comfort and for energy efficiency. Shading panels carefully control the amount and quality of daylight that enters, while exterior landscaping creates lush suspended gardens that also help control light. Cooling of the tower will be achieved with the use of natural ventilation and chilled beams. Low-flow faucets will minimize water use and grey water will also be recycled for use in landscape irrigation on the exterior and the rooftop gardens. The tower will produce all of its own energy using both solar on the facade and fuel cell technologies that make use of methane gas; a grid connection will allow the building to give and take energy as needed. The developers claim that RB12 will be the first commercial building in Brazil to use photovoltaic panels for its own electricity production. The project is expected to begin in 2015. The Rio Branco 12 office tower on Rio Branco Avenue in the Porto Maravilha region near the water will have 21 floors. Currently undergoing an urban revitalization, Porto Maravilha is slated to become a new urban and commercial district with over 5 million sq ft being redeveloped along with new roadways, a public tram line and new public green space. 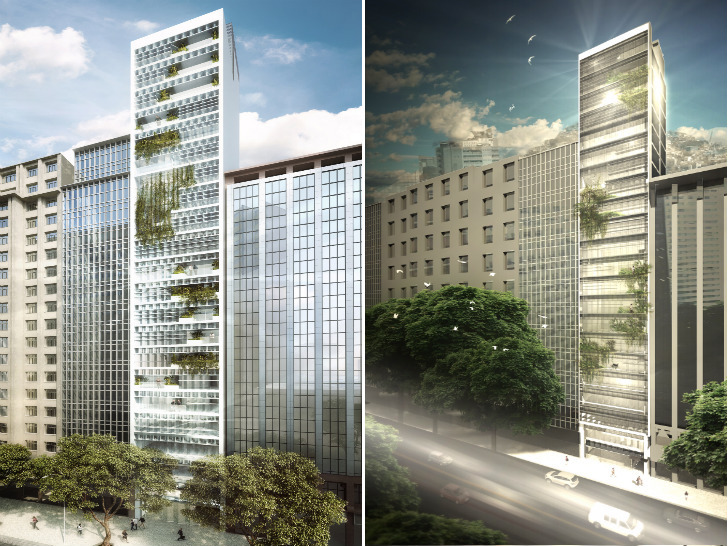 The eco office tower designed by Triptyque will be built by Natekko and funded by MMC Investimentos, which is working on affordable housing and green-refurbishment in São Paulo and Rio de Janeiro. RB12 will be both luxurious and sustainable and the developers hope to set a new standard of development with its construction. The tower has been carefully designed for both indoor occupant comfort and for energy efficiency. Shading panels carefully control the amount and quality of daylight that enters, while exterior landscaping creates lush suspended gardens that also help control light. Cooling of the tower will be achieved with the use of natural ventilation and chilled beams. Low-flow faucets will minimize water use and grey water will also be recycled for use in landscape irrigation on the exterior and the rooftop gardens. The tower will produce all of its own energy using both solar on the facade and fuel cell technologies that make use of methane gas. A grid connection will allow the building to give and take energy as needed. The developers claim that RB12 will be the first commercial building in Brazil to use photovoltaic panels for its own electricity production. Interior detail of some of the office space. The project is expected to begin in 2015.